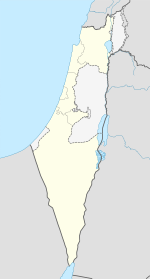 Haifa (Ebreu: חֵיפָה‬); is the lairgest ceety in northren Israel, an the third-lairgest ceety in the kintra, wi a population o 278,903 in 2015. Anither 300,000 fowk bide in touns directly adjacent tae the ceety includin the ceeties o the Krayot, as weel as, Tirat Carmel, Daliyat al-Karmel an Nesher. Thegither thir auries form a contiguous urban aurie hame tae near 600,000 residents that maks up the inner core o the Haifa metropolitan aurie. Haifa haes a mixed population o Jews an Arabs, awtho Jews mak up tae 90% majority. The Arab population is predominantly Christian, whauras 28% o the Jewish population (correct for 2009) is made o immigrants frae the umwhile Soviet Union. It is hame tae the Bahá'í Warld Centre, a UNESCO Warld Heritage Site, an aw. Built on the sclents o Munt Carmel, Haifa haes a history datin back tae Biblical times. The earliest kent dounset in the vicinity wis Tell Abu Hawam, a sma port ceety established in the Late Bronze Age (14t century BC). In the 3rd century AD, Haifa wis kent as a dye-makin center. Ower the centuries, the ceety haes chynged haunds: It haes been conquered an ruled bi the Phoenicians, Ebreus, Persians, Hasmoneans, Romans, Byzantines, Arabs, Crusaders, Ottomans, Egyptians, Breetish, an the Israelis. Synee the establishment o the State o Israel in 1948, the ceety haes been govrened bi the Haifa Municipality. The day, the ceety is a major seaport locatit on Israel's Mediterranean coastline in the Bay o Haifa coverin 63.7 square kilometres (24.6 sq mi). It is locatit aboot 90 kilometres (56 mi) north o Tel Aviv an is the major regional centre o northren Israel. Twa respectit academic institutions, the University o Haifa an the Technion, are locatit in Haifa, an the ceety plays an important role in Israel's economy. It haes several heh-tech pairks, amang them the auldest an lairgest in the kintra, an industrial port, an a petroleum refinery. Haifa wis umwhile the wastren terminus o an ile pipeline frae Iraq via Jordan. The oreegin o the name "Haifa" is unclear. Accordin tae historian Alex Carmel, it mey come frae the Ebreu verb ruit חפה (hafa), meanin tae kiver or shield, i.e. Munt Carmel covers Haifa. Anither possible oreegin is the Ebreu wird חוֹף (hof), an aa meanin beach, or חוֹף יָפֶה (hof yafe), meanin bonnie beach. Some Christians believe that the toun wis named efter the heich priest Caiaphas, or Saunt Peter (Keiphah in Aramaic). ↑ "Table 3 - Population of Localities Numbering Above 2,000 Residents and Other Rural Population" (PDF). Israel Central Bureau of Statistics. 2010-06-30. Retrieved 2010-10-30. ↑ "Haifa". Jewish Agency. Archived frae the oreeginal on September 26, 2007. Retrieved 2007-05-05. 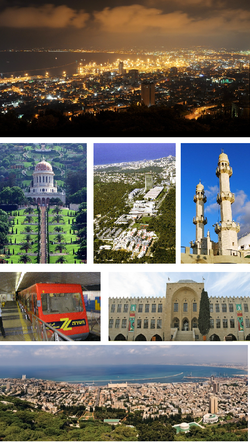 ↑ Haifa, The Jewish Agency for Israel. Retrieved June 20, 2009. ↑ "GavYam". Gav-Yam.co.il. Retrieved 2008-02-18. ↑ Cohen, Amiram. "U.S. Checking Possibility of Pumping Oil from Northern Iraq to Haifa, via Jordan". Haaretz. Retrieved 2008-12-06. ↑ Winter, Dave (1999). Israel Handbook: With the Palestinian Authority Areas. Footprint Travel Guides. p. 560. ISBN 9781900949484. Retrieved 2009-07-26. Wikimedia Commons haes media relatit tae Haifa. This page wis last eeditit on 30 Januar 2019, at 16:44.